The 2017 Inter-Pacific Exchange is coming up soon. Follow our US team members as they go learn and compete with other Pony Club members from around the world! To learn more about this and all of the USPC International Exchanges, click HERE. Susan Thomas is the Coach for the 2017 USPC Inter-Pacific Exchange team. She is an A graduate (Piedmont Pony Club, South Region) of the United States Pony Clubs, Inc. and currently operates her own teaching and training business, Charbonnet Sport Horses, LLC. She grew up in the Shenandoah Valley of Virginia in Glenmore Hunt Pony Club. After finishing high school in Maryland, she studied Equine Science and Agribusiness at the University of Georgia. Susan worked in barn management after her graduation from the University of Georgia, and did a lot of foxhunting while continuing to teach lessons and compete in the sport of Eventing. 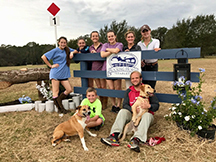 She started Charbonnet Sport Horses in 2014, and coaches students of all ages, while competing multiple horses in nationally and internationally recognized competitions. This is her first year coaching the IPE team, however, she participated as a team member several years ago during the New Zealand Exchange. Susan is excited to spend some time with the team, getting to know each of them and helping them to make the most of this unique experience!